Mandsaur is an ancient town in Madhya Pradesh and is believed to have been in existence since the advent of the Common Era. It is said to have been founded by the Aulikaras when Mandsaur was popular as Dashapura. Since then, it has been ruled by several dynasties from the past, ranging from the Gurjara-Pratihara dynasty to the British and the Delhi Sultanate to the Holkar dynasty. Today, it is flourishing as a historic town with natural surroundings and is popular amongst locals and seasonal tourists for the presence of the ancient Pashupatinath Temple, which is one of its kind in India and is visited by thousands of tourists on a regular basis. Hence, Mandsaur is considered as a town of historical, religious and natural significance. As per Hindu mythology, it is also believed that Mandsaur was the home of Ravana's wife, Mandodari. Hence, there are several communities in Mandsaur which worship Ravana and don't partake in the events of Dussehra which include the burning of Ravana's effigy. Isn't it an interesting place to explore? If you are keen on getting yourself here, then following are the places which you should not miss visiting within its boundaries. Mandsaur is easily accessible from Indore. One of the most recognisable structures in the historic town of Mandsaur, Mandsaur Fort, also known as Dashapura Fort, is a must-visit tourist spot for history lovers. As per records, the history of the fort dates back to the era of the 15th century when Mandsaur was under the control of Hoshang Shah, the first Muslim ruler of the Malwa region. However, later on, it was conquered by several other kings, ranging from Mewar kings to the Mughals. Surrounded by an impregnable wall, Mandsaur Fort boasts of twelve gates, which were used to keep a watch on the invaders. The beautiful architecture of the fort is also commendable, considering its brilliant setting. Even though the fort is in a dilapidated condition today, it still a sureshot stoppage for history lovers. Acting as a green lung to Mandsaur, Gandhi Sagar Sanctuary is a reserved area established in the year 1974 to preserve the natural beauty of the region. It is also one of the few wildlife sanctuaries in India which are archaeologically, historically and religiously important too. From witnessing historic structures to beautiful waterfalls and ancient temples to stunning caves, there is a lot to do within its boundaries. Apart from savouring rich and diverse wildlife, you can also visit Bhanpura Museum, Chaturbhuj Nath Temple, Hinglaj Fort and Taxakeshwar Temple. The presence of gorgeous Chambal river flowing through the sanctuary certainly adds to the glory and charisma of Gandhi Sagar Sanctuary. 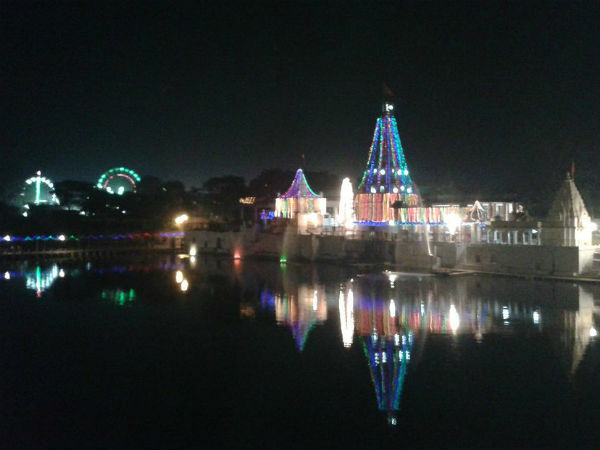 Unarguably, the most visited tourist spot, Pashupatinath Temple is the invaluable splendour of Mandsaur. You must not miss visiting this ancient marvel, which is dedicated to Lord Shiva and dates back to the 5th century. Mentioned in several ancient texts and inscriptions, Pashupatinath Temple has always been a revered pilgrimage sites in the central region of India amongst Hindus since its formation. Nestled peacefully on the bank of Shiva river, this wondrous beauty is also special on account of the presence of the eight-faced Shivalinga, which is one of the rarest Shivalingas to be found in the world. If you get fascinated by mythology and its interesting legends, then this temple is definitely your stoppage. Another beautiful temple within the boundaries of Mandsaur, Shree Bahi Parshwanath Temple is a newly-formed temple and is dedicated to Lord Parshvanath, the 23rd tirthankar of Jainism. The beautiful environment and the fresh atmosphere of the temple are the major reasons behind its popularity amongst tourists. You must catch a glimpse of this stunning beauty if you are looking forward to relaxing in a tranquil ambience. Teliya Tank is a perfect spot to witness the beauty of sunrise and sunset in Mandsaur. You can find here numerous locals savouring the beauty of colourful sunrays as they take a dip in the waters of Teliya Tank and reflect back, thereby, creating a vibrant atmosphere. If you desire to take a break from exploring the historical and religious places of Mandsaur and want to soothe your mind, then it is advisable to get yourself amid the beauty of Teliya Tank, which will calm your nerves. On account of its scenic beauty, it is also a perfect spot for nature photography. Dhamnar Caves are some of the oldest rock-cut caves in Madhya Pradesh and date back to the 4th century. It is a complex of Hindu and Buddhist cave temples and houses the ancient temple of Dharmrajeshwar, which is believed to be carved out of a single rock during the 9th century. It is a must-visit site for architecture and history lovers. You can also visit its other tourist attractions which include Shree Khade Balaji Temple, Bandi Ji Ka Baag, a 120-year-old Jain temple, Anugrah Church, Maa Durga Temple and Vishnu Mandir.